Deal Book. Although the stock price got “hammered” last week, it was really the analysts who got “nailed” because they were “surprised” (some said “shocked”) by company guidance that suggested trimming back their earnings expectations in the next year (The Associated Press, October 17, 2013, Stanley Black & Decker shares continue to fall after lowering full-year profit expectations). To us, that’s pro forma, not unusual at all, and business as usual because the company – in our view – has done a magnificent job in earning the stock price that’s implied by its balance sheet. Please see Exhibit 1 below. Of the seventy-odd analyst reports that we’ve surveyed (but not read), only one suggested “sell” (since changed to “buy”) and all the others wavered between “buy”, “hold”, “strong buy” to “neutral” or “market perform” and various “weights“. What is this, a beauty contest? Are we supposed to buy, hold or sell a stock because 50% or more of the analysts – all of whom are able and experts – say one thing or another and it comes down to a “vote”? 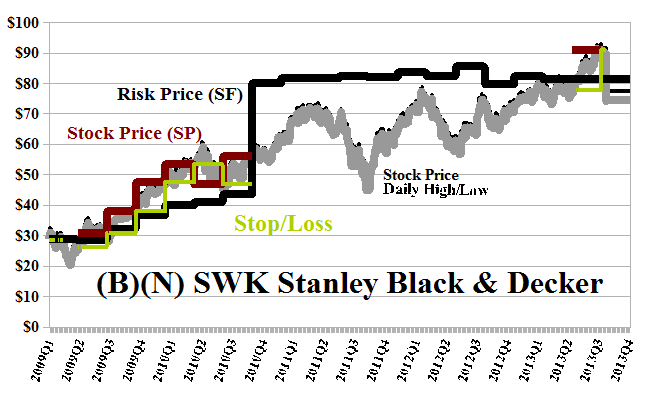 The real story is that the acquisition of Black & Decker by Stanley Works in 2010 was done for stock – the shareholders of Black & Decker received 1.275 common shares of Stanley Works for each share that they owned, effectively diluting the stock of Stanley Works by 50% for a company that was now three times as big. However, “bigger” also needs to show that it’s better and the standard for “better” is not that the volatility of prices or earnings remained the same but if we buy this stock or keep this stock, is our investment in the stock “as good as cash and better than money” and that’s the “price of risk” and not just the stock price or the earnings per share. Although Wall Street basically approved of the deal and boosted the stock price by a few percent at the time, the stock price has been a roller-coaster ride ever since, as the company went about doing its business (and there have been other notable acquisitions since) and investors wavered between confidence and doubt. On the other hand, the price of risk jumped from $45 to $80 and has not come down (please see Exhibit 1 below) and the stock price has gradually risen to that level. Investors who the bought or kept the stock at $50 have done well, but only if they had the confidence that the stock would eventually earn its price of risk, and stayed the course. 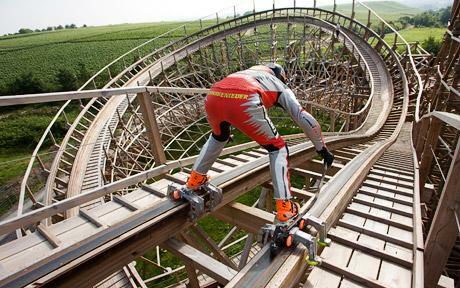 Some investors might have done well riding the roller coaster, but that would exclude most of us. If the deal had been done for cash, the price of risk would not have changed at that time; and even for debt, the price of risk could have decreased if investors really liked the deal. But our jury was sensibly out, and we’ve only been able to buy the stock recently, and then only cautiously with our usual price protections in place. The company expects to pay a dividend of $320 million to its shareholders this year for a current yield of 2.6%. Our estimate of the downside in the stock price due to the demonstrated volatility is minus ($7) per share so we would not be surprised by any price between the current $80 (down from $90 last week) and $75 to $90 again. Stanley Black & Decker Incorporated is a global provider of power and hand tools, mechanical access solutions, electronic security and monitoring systems, and products and services for various industrial applications. From the Company: Stanley Black & Decker, Inc. provides power and hand tools, mechanical access solutions, and electronic security and monitoring systems for various industrial applications primarily in the United States, Canada, Europe, and Asia. The companys Construction & Do It Yourself segment offers professional corded and cordless electric power tools and equipment, such as drills, impact wrenches and drivers, grinders, saws, routers, and sanders; corded and cordless electric power tools, lawn and garden products and home products; and hand tools, fasteners, and storage products to professional end users, distributors, and retailers. Its Security segment provides electronic security systems; electronic security services, such as alarm monitoring, video surveillance, fire alarm monitoring, and systems integration and maintenance; healthcare solutions comprising medical carts and cabinets, asset tracking, infant and pediatric protection, patient protection, wander and fall management, and emergency call products; and automatic doors, commercial hardware, locking mechanisms, electronic keyless entry systems, keying systems, and tubular and mortise door locksets. This segment sells its products to consumers; retailers; educational, financial, and healthcare institutions; and commercial, governmental, and industrial customers. The companys Industrial segment offers hand tools, power tools, and engineered storage solution products; engineered fasteners; and custom pipe handling machinery, joint welding and coating machinery, weld inspection services, and hydraulic tools and accessories to the automotive, manufacturing, aerospace, and natural gas pipeline industries. This segment sells products through third party distributors and direct sales force. The company was formerly known as The Stanley Works and changed its name to Stanley Black & Decker, Inc. in March 2010. Stanley Black & Decker, Inc. was founded in 1843, has 45,000 employees and is headquartered in New Britain, Connecticut.